Motorcycles are exhilarating and everyone loves the freedom of the open road with the wind blowing against you. While having a winding journey is fun, the problem is that it’s easy to get lost. Because of this, many riders like using a GPS like with cars, but they present a few unique challenges. Aside from a lack of flat surfaces (which are often needed for car GPSs to affix the unit), there’s also the wind that could easily blow a GPS off and into the street. Not only that, but driving a motorcycle is much different from driving a car, and the GPS should reflect that. Here we’ll go through the best motorcycle GPSs available so that you know where to look for. When it comes to motorcycle GPSs, most of them are several hundred dollars. So it’s hard to talk about cheap options since even the cheaper ones are a small investment. But if you’re willing to use your own smartphone as a GPS instead of a dedicated device, then a mount is a good option. It gives you a steady holder that will keep your smartphone in place, and the Crow Foot has a few additional safety features to ensure it stays in place, but some people might be worried about their smartphone smashing into the street during their ride. That aside, this holder has a good number of features and it’s very easy to setup. First, open the side arms and place your phone on the main plate. Close the arms to ensure that it’s snug. Then, extend the bands at the side and wrap them around the phone for extra stabilization (this is considered an optional step for bicycles, but it’s a necessity for motorcycles). Lastly, open the clasp at the bottom, place it on your handlebars and lock it down. That’s it. Now you have your smartphone securely affixed to your motorcycle so that you can use your favorite GPS app. Aside from an easy installation, the Crow Foot has a few other features you’ll love. The main plate is rubberized so that it absorbs shock and keeps the device from jostling around. You can easily turn the phone to get the right orientation, though most riders prefer portrait as it makes it easier to install the phone. This product doesn’t give you many bells and whistles, but it gets the job done. 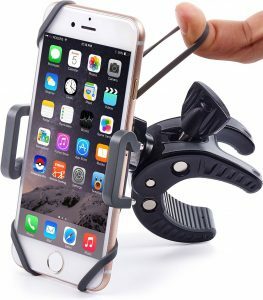 If the price is your main consideration, then this is your best bet as long as you have a smartphone to use with the holder. If you’re looking for a dedicated GPS unit for your motorcycle, then keep going down to see what else is available to you. If you’re looking for the best motorcycle GPS, then the Rider 400 is definitely in the running. This has so many features and has such great screen clarity that it’s close to being a premium item, but we have to put it here due to its fairly low price point when compared to other premium items. This is the biker’s dream with all its features and tools, making your journey as quick or winding as you like. First of all, let’s talk about the route options. Normally with a car GPS, you can only control this so much. You might be able to switch between the fastest route and those without toll booths, but that’s about it. With this motorcycle GPS, you can select either a straight path or winding roads to make the trip more exciting. You can also choose to keep the trip flat or to go high above the sea level to get the best views. It all depends on how adventurous you feel. Not only that, but you can just click anywhere on the map and immediately get a round trip made up so that you can discover new areas. One of the best things about car GPSs is that they give you verbal directions and cues to make it easier to get to your destination. Many cheaper motorcycle GPS’s don’t have this, but the Rider 400 does. You can wirelessly connect it to any headset and get the directions as you’re riding. Now you’ll have no problem getting from point A to point B. The screen size here is about 4.3 inches, which is respectable. While this makes it a little easier to hold in your hand, it might be a little too small for some people when it comes to viewing the intended route. This is one of these aspects of the Rider 400 that differentiates it from premium units as they tend to have larger screens, but the good news is that the resolution here is crystal clear. Speaking of clarity, you might be worried that the screen will be hard to see when it’s bright and sunny out. Don’t worry. There’s a high contrast mode that you can activate that makes the screen very easy to see despite the glare. You can switch this on and off with a button, so you won’t have to go through a thousand menus to make it work. 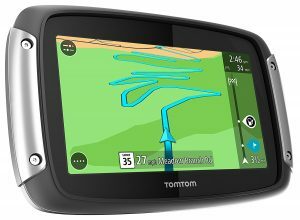 Planning a trip with this GPS is a breeze, and you’ll be so happy with the simple computer integration. You can easily choose where you’re going, where the roads will take you, what you do and don’t encounter and so on and so forth. This makes it so easy to customize your entire ride, and the GPS will store all the information for when you’re ready to start riding. You can actually store multiple trips on the included SD drive. Aside from the somewhat smaller screen, which is hardly an issue, this is easily one of the best motorcycle GPSs on the market. It’s responsive, has a ton of features and just makes your journey fun. Definitely check this out if you want premium performance and tools for half the price. You’re going to find that the Zumo 395LM is a lot like the Rider 400, but nearly all of the features are even better. This item is one you’ll get if the price is no problem and you just want the most and best features. Let’s start off with the screen. As stated above, one of the small downsides of the Rider 400 is that the screen is smaller than other GPSs and most modern phones. You’ll find that this isn’t a problem with the Zumo 395LM. The screen is a nice 5 inches, and believe me, you’ll really notice that extra 0.7 inches. Not only does it make it so much easier to see your route, but the extra clarity just makes the ride more enjoyable. You can see more of the road, and you won’t have to squint your eyes at all to make sure you’re going the right way. 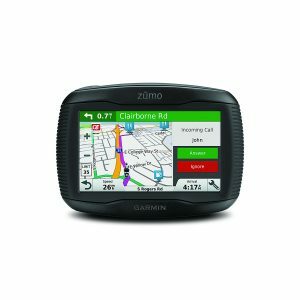 Garmin Adventure Riding has a lot of features we talked about with the Rider 400, but a few additional ones. You can customize your ride to either be a straight ride or really winding and bumpy. You’ll really feel the expanse of the open road or get to your location as quickly as possible without incident. It’s easy to switch back and forth, so you can do it on the fly. There are also many warnings and settings to play with. The GPS will warn you if dangerous turns are coming up so that you’re ready to slow down or react appropriately. If you’re crossing state lines, then the Zumo will help ensure that you’re properly wearing your helmet and other safety gear so that you’re not unnecessarily pulled over by the police. You’ll love the array of Bluetooth bells and whistles that make your ride even more enjoyable. You can control your phone, music apps (like Pandora and Spotify) and get alerts if people are trying to call you. You can also connect the device to a Bluetooth headset to hear the directions spoken to you as you’re riding. Glare isn’t an issue at all with the bright screen and clear resolution. You’ll have no problem reading the route regardless of whether it’s early or late. Another great (and safe) feature is the glove-friendly interface. You always have to consider this with touch-based technology and motorcycles. Most smartphones are made with work with the skin, but that can be a bad thing when you’re wearing gloves. The Zumo works perfectly fine whether you have gloves or not. If you want the best motorcycle GPS that has every feature that you could ever want, then this is it. You’ll love how much the Zumo can do for you and how safe and efficient it is. While you have to sink a fair amount of money into it, this device is worth every penny.